The long battle against the division by zero may well be over now that the equation for the Theory of Everything (ToE) tears all of physics to shreds. As it turns out the division by zero problem is the greatest mathematical support for equation of the ToE. Computers really don't like dividing by zero. Opening up the calculator application in XP and calculating, say 42 / 0, will equal the friendly message - "Cannot divide by zero". When trying to divide something by zero in a programming context, say using PHP, you'll strike an error something like - "Warning: Division by zero in divide_by_zero.php on line 1". So what's the problem? The problem is that dividing something by zero is illogical in a computing terms. In general life, the concept also doesn't come up terribly often - "Could you give me a hand dividing this apple amongst zero people?" 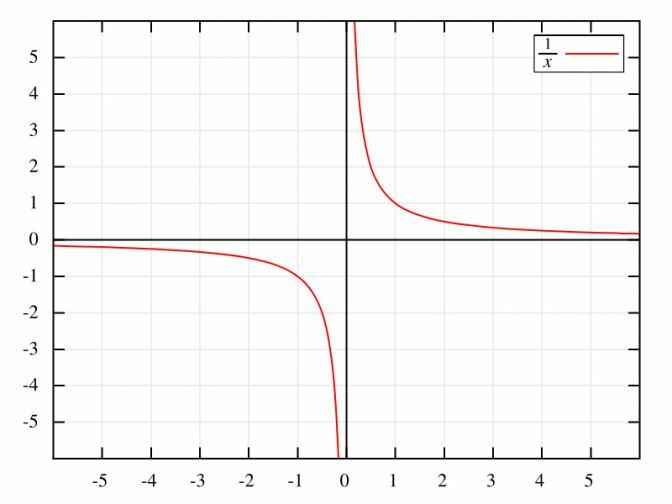 1) if you plot the division of a whole number by smaller and smaller numbers (Figure 1), say for instance, first dividing 1 by 1, then dividing 1 by 0.5, then dividing 1 by 0.25 you will notice an exponential scale start to form. As the dividing value gets closer to zero the resulting value gets exceedingly large. Now, as the dividing value goes past zero into negative territory the resulting value becomes a large negative number and becomes smaller as it approaches 1. It certainly seems possible to draw the conclusion that as the dividing number reaches zero the resulting number approaches an amazingly large number which could only be described as infinity. 2) in the real world using elementary arithmetic, it doesn't make a lot of sense if you attempt to divide a physical thing by fractions, by negative numbers or by zero. If you try to divide an apple amongst zero people nothing happens to the apple. The apple remains the same. Could it then be said that dividing an apple by zero leaves the apple whole, thus: 1 divided by 0 equals 1? 3) Or conversely, if you try to divide an apple amongst zero people, not one person receives any of the apple. Could it then be said that dividing an apple by zero leaves everyone with none of the apple, thus: 1 divided by 0 equals 0? These are but three answers derived by different ways of looking at the division by zero problem. All answers are valid and show that it depends on a relative perspective that makes each answer meaningful in it's own way. There are more ways than the three example given that can produce seemingly valid, not to mention, seemingly contradictory answers. Visit the fallacies based on division by zero on Wikipedia to find out more. Science and Mathematics have always hated the idea of a paradox behind division by zero much like Einstein hated the consequences of the uncertainty principle. The paradox has been so disliked by Science and Mathematics that the problem has been scraped and given the blanket rule - "You cannot divide by zero". The paradox itself is the basis for the ToE and it is only until the paradox is understood in terms of the ToE, that there ceases to be a paradox at all. As the paradox is understood it becomes apparent current computing, scientific and mathematical areas have given little thought to a major issue that has existed for a long time.